Steiner's Protect-O-Screen® Classic™ is the time-proven industry standard for welding screens. Protect workers, material, and equipment from hazards of welding sparks, spatter, and UV flash. The Protect-O-Screen® Classic™ system offers complete flexibility to build any size or shape enclosure you need with in wide variety of tinted transparent and non-transparent curtain materials, colors and sizes. Use 2-, 3- or 4-panel Connect-O-Screen™ connectors to form multi-side enclosures or in-line dividers. Steiner’s unique Connect-O-Screen™ connection system joins single Protect-O-Screen® Classic™ using 2-, 3- or 4-panel connectors to form multi-sided enclosures, in-line dividers, or safely enclose on four sides. 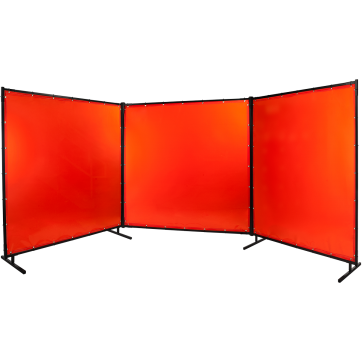 Connect-O-Screen™ is easily inserted into the frame top and bottom corners of adjoining frames. The unique modular design allows for the addition, removal, replacement or rearrangement of individual panels to adapt to new requirements in just minutes. Connects 2 single Protect-O-Screen ® Classic™ panels to form a 2-, 3-, or 4-sided enclosure. Connects 3 single Protect-O-Screen ® Classic™ panels to form a common hub to divide welding stations. Connects 4 single Protect-O-Screen ® Classic™ panels together from a common hub to create station dividers or enclosures.